A stylish umbrella is the perfect accessory, especially if you follow the basic rules of umbrella etiquette. It seems to be a largely forgotten art, but you can impress your friends and strangers on the street through the ease and graciousness with which you handle an umbrella. It's no wonder that practicing good manners requires attention. When your umbrella is in use, it's not a good idea to let yourself get distracted by daydreams or your smartphone. Your hand is already occupied holding the umbrella, so keep your other hand available for other tasks, which should never include texting or updating your status on social media. Allowing yourself to be distracted is almost guaranteeing a painful collision with an unsuspecting passerby. While the quality of the umbrella you carry says a great deal about your personal taste, you should also select one based on its size. A petite person would be overwhelmed by an oversized golf umbrella. Imagine a powerful gust of wind coming up unexpectedly. If you're small, it may feel as though you're about to be swept off your feet. While you're unlikely to take flight, you may be unable to avoid running your umbrella into someone else. Accordingly, it's good manners to choose a canopy size that is right for your frame. Busy, crowded sidewalks can be difficult to negotiate, especially when everyone is carrying an umbrella. Taller people might consider raising their umbrella higher up over their head to accommodate smaller pedestrians. At the same time, shorter people can bring their umbrellas down to just above their heads. Known as the "umbrella dance", this graceful accommodation of others is a wonderful way to show courtesy. If you are fortunate enough to find yourself walking under an awning or other covering, it's usually advisable to close the umbrella to make it easier for others to pass by. Alternatively, if the sidewalk provides room for you to walk on a section of sidewalk that is not covered by an awning, keep to this portion and keep your umbrella up. This way you're making it possible for people who don't have an umbrella to take full advantage of the awning. Walking with a closed umbrella can be hazardous for those around you. Always carry it with the pointed end down, resisting the urge to carry it horizontally or to swing it, either of which can cause injuries or irritation. Before you enter a building, tap your umbrella on the sidewalk to remove some of the excess water. Upon entering, place the umbrella into the cover it came in or in one of the plastic bags often provided by stores or large office buildings. If no such bags are available, ask your host where you should place it to avoid dripping on the floor. Hopefully an umbrella stand is provided. If not, make certain that you leave your umbrella in an out of the way place where no one will trip over it. Umbrellas can be quite a nuisance on public transportation. Make certain to be polite with yours by never placing it on a seat where it may leave a puddle for someone to sit in. It generally makes sense to simply hold the umbrella in your hands or even place it on the floor at your feet where you'll remember to retrieve it. Before opening your umbrella, spend a brief moment taking in your surroundings. Just like crossing the street, it's important to look both ways before opening an umbrella so as not to put someone's eye out or risk showering them with water. 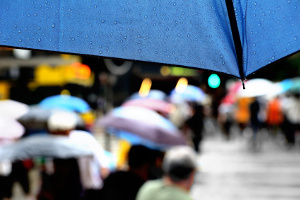 With these etiquette tips, you'll be ready to tackle even the rainiest of days.